As part of the electrical supply upgrade to NHP’s head office in Richmond, the main switchboard was replaced by a more robust CUBIC modular switchboard manufactured by Dara Switchboards. The MSB is fitted with NHP premier range Terasaki switchgear and fitted with Selco arc detection relay with point sensors to reduce the effect from an arcing fault. Since 2010, DaRa Switchboards have been designing and manufacturing custom switchboards for customers throughout Australia. As one of the leading switchboard manufacturers in Australia, we offer innovative products that you can rely on, together with a customer-focused approach that has helped us become a key supplier to industry leading companies such as NHP, specialists in motor control, power distribution and automation systems and the manufacturer of the world famous NHP Terasaki circuit breaker for industrial and marine applications. And, as they have over 50 years of electrical and engineering industry excellence across 49 locations across Australia and New Zealand under their belts, being asked to replace one of the main NHP switchboards for their head office in Richmond was testament to the quality of our products and our service. 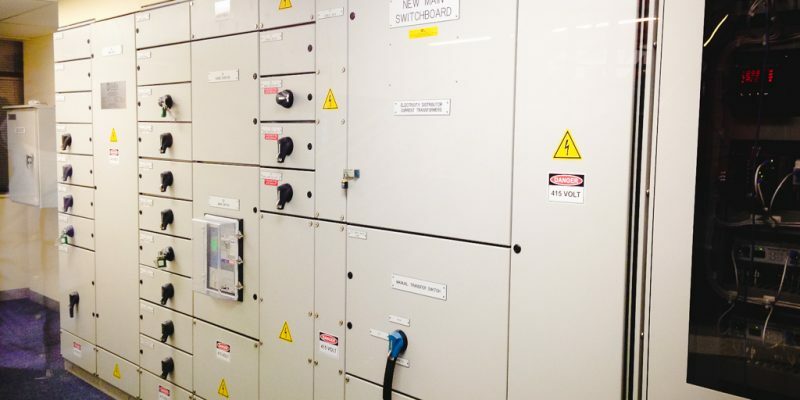 Our remit was to replace the main switchboard at NHP’s head office in Richmond as part of an electrical supply upgrade. To do this we replaced the existing switchboard with a more robust CUBIC modular switchboard which we manufactured in our 5000m2 manufacturing facility in Melbourne. The main switchboard is fitted with NHP premier range Terasaki switchgear and Selco arc detection relay with point sensors to reduce the effect from an arcing fault. As a leading supplier of custom switchboards throughout Australia, we always aim to provide the very best products, together with personal customer service. We’re not only an ISO 9001: 2008 accredited company, with stringent quality control procedures, but also have accreditation from original manufacturers such ELSTEEL and Legrand LX3. We’re also fully accredited (assemblies above 3200A & drawout / plug in motor control centres) to build the CUBIC modular switchboards, as installed in NHP’s Richmond Head Office. Furthermore, as members of the National Electrical Switchboard Manufacturers Association and the Clean Energy Council of Australia, we offer a level of excellence and service that simply can’t be beaten. As a major supplier of custom switchboards Australia-wide, we’re known for the quality of our switchboards, and our ability to deliver our products on time and to budget. We’re suppliers to many multi-national, international, and national companies and organisations, including BP, Tesla, BHP Billiton, Puma Energy, Origin Energy, Energy Australia, Sunpower, Citipower Powercor and the Australian Government Bureau of Meteorology. For more information on any of our switchboard design, manufacture and installation services, or to arrange a meeting to discuss your custom switchboard requirements, call our sales and engineering team on 03 8544 3300, send an email to info@dara-switchboards.com.au or complete our online contact form and we’ll get back to you as soon as possible. Dara are a switchboard manufacturing company based in Melbourne. We sell switchboard gear online such as switchboard escutcheon, switchboard enclosures, meter panels & more.